We are witnessing the remarkable resurgence of artificial intelligence, especially in the finance sector thanks to the peculiar combination of several demand and supply factors. 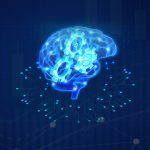 The AI has paved the way for rapid and massive growth in finance with the sophisticated algorithms and computing ability, availability of data and modern infrastructure, and the high potential for revenue gains and cost reduction. 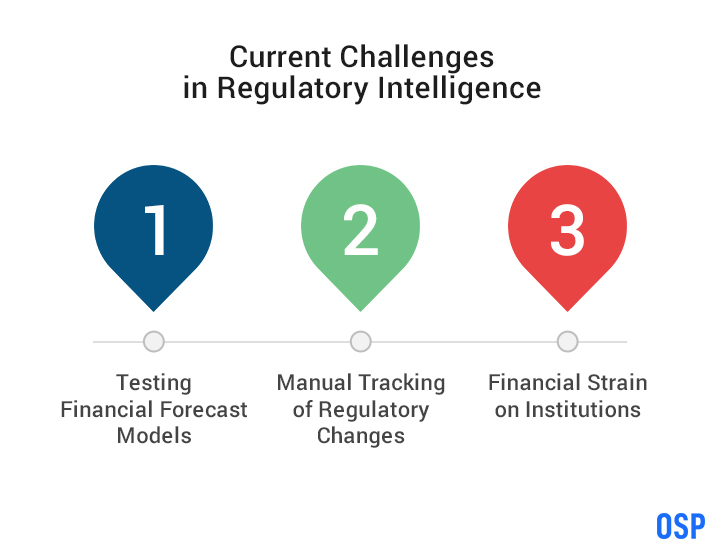 We are analyzing, how AI in regulatory intelligence can extend the growth potential of the finance industry. We will discuss AI banking and AI in financial planning services to assess the new capabilities of AI to process high speed and high volume data with advanced algorithms and deep learning techniques. Regulatory intelligence is the process of identifying and adhering to regulatory compliance. In this particular case, we are referring to regulatory intelligence within the finance sector. Through the introduction of technology, financial institutions are able to conform with regulations more swiftly and cost effectively. Testing Financial Forecast Models: Forecast models are dished out in large quantities and the ability to analyze data and make accurate forecasts is increasingly difficult through manual execution. Hidden patterns are scarcely identified due to the fact that they are usually buried deep in historical financial data. Manual Tracking of Regulatory Changes: The traditional rule-based methods are unable to track frauds. Additionally, financial implications and regulatory requirements vary drastically across borders and compliance serves as a huge challenge for cross-border interactions. Accurate identification, documentation and summarization are almost impossible to execute, while keeping up with the constantly shifting paradigm. Financial Strain on Institutions: Failure to comply with regulatory requirements puts a heavy financial strain on banks and other institutions. Compliance risks are rarely identified and go by unnoticed. The ineffectiveness of efficient regulatory tracking incurs heavy fines on financial institutions. Anomalies remain unidentified during the process and therefore, heavy penalties are levied. Automated process and management of regulatory compliance is the need of the hour. These technologies can go a long way in reducing inefficiencies and frauds. Automated end-to-end Process: Opting for AI technologies that offer integrated solutions can streamline the entire lifecycle of regulatory compliance. The automated process makes it impossible to move to the next level if compliance is missing at any level. It further offers suggestions to enable efficient compliance. Up-to-date Regulatory Requirements: Through automated systems, keeping up with changing regulatory laws and cross-border differences does not require manual research and updating. The systems are geared to automatically track and install changes and compliance differences across borders. Reduced Risks and Costs: The AI technologies make it close to impossible for frauds to go unidentified and reduce the cost involved in manual hours of research and analysis. Audits are executed in a timely and efficient fashion with minimal manual involvement, through comprehensive reporting capabilities. Financial planning is essentially executed to efficiently analyze the customer’s financial standing and offer solutions for improvisation. These suggestions include financial steps, such as, investments, allocations, budgets, spending, etc. Financial planning services have been faced with a number of challenges related to the human involvement in the process. 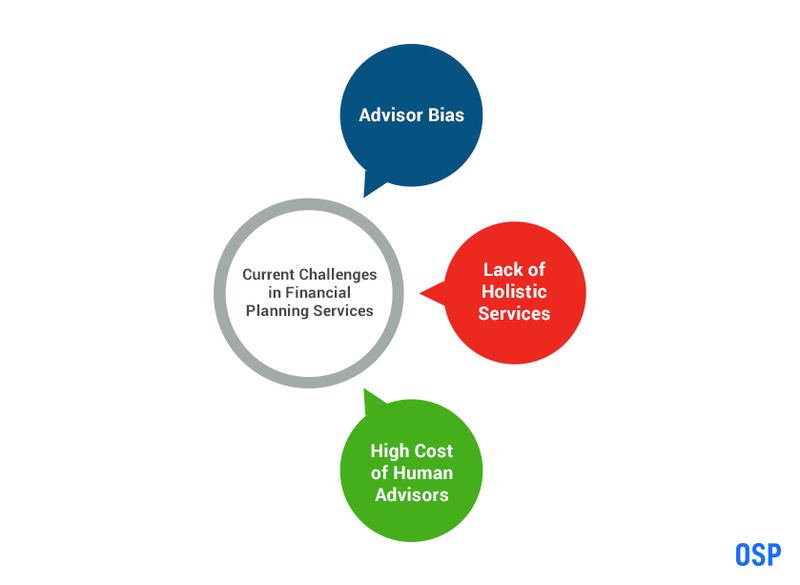 Advisor Bias: When financial investment suggestions are made by human advisors, there is always the possibility of a bias coming into play, which does not accurately reflect the interests of the customer. A holistic allocation is rarely achieved due to this bias. Lack of Holistic Services: Many a times, customers are faced with a lack of complete awareness with regard to diversifying their portfolio, managing passive investments and automatic reinvestments. High Cost of Human Advisors: Wealth advisors are usually an expensive luxury and reserved for customers who can afford it. There is usually a high amount of wealth that needs to be involved for a financial planning service to be deployed, as human advisors generally charge 1% of the wealth being invested. These digital platforms provide financial planning suggestions through automated systems that are algorithm-based and are free of human intervention or requirement. 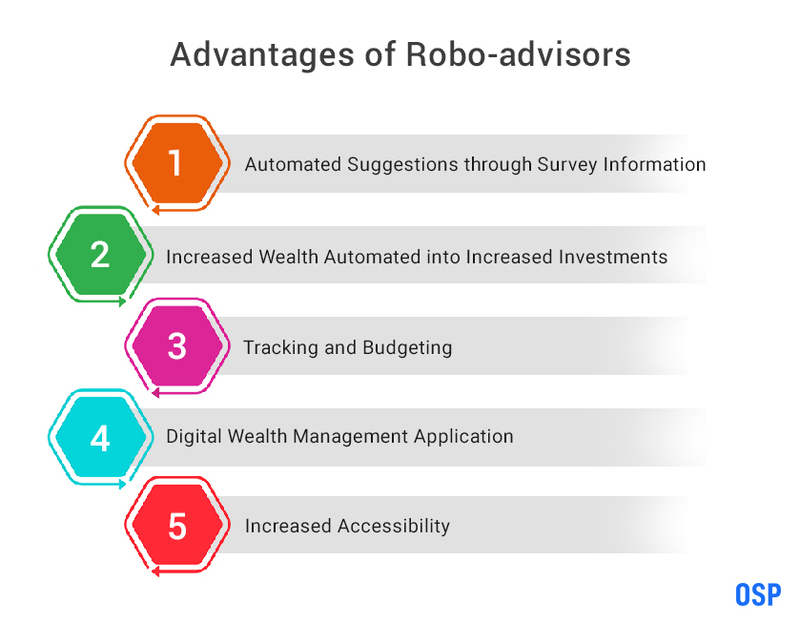 Automated Suggestions through Survey Information: Robo-advisors are embedded with the capacity to offer financial suggestions, including complicated financial analysis such as, tax-loss harvesting, retirement suggestions and planning and investment choices. The only requirement is that an automated survey be filled out, wherein the customer enters their basic financial information. Increased Wealth Automated into Increased Investments: Through the use of AI technologies, financial planning has reached a point where the user’s wealth is not only increased through wise suggestions, but further invested swiftly. Tracking and Budgeting: Robo-advisors can track the customer’s spending pattern through the monitoring of their bank and credit card activity and thereafter, suggest budgets for further financial gain. Digital Wealth Management Application: Large corporations benefit greatly from robo-advisors due to their automated ability for tax management and retirement planning that stays impeccably consistent across the organization. Increased Accessibility: With the availability of automated tools, lower fees and taxes, robo-advisors are turning into an attractive option for customers. The future of banking is poised to be featured with Artificial Intelligence, to the extent that it will be the primary factor in the operation of the banking sector. 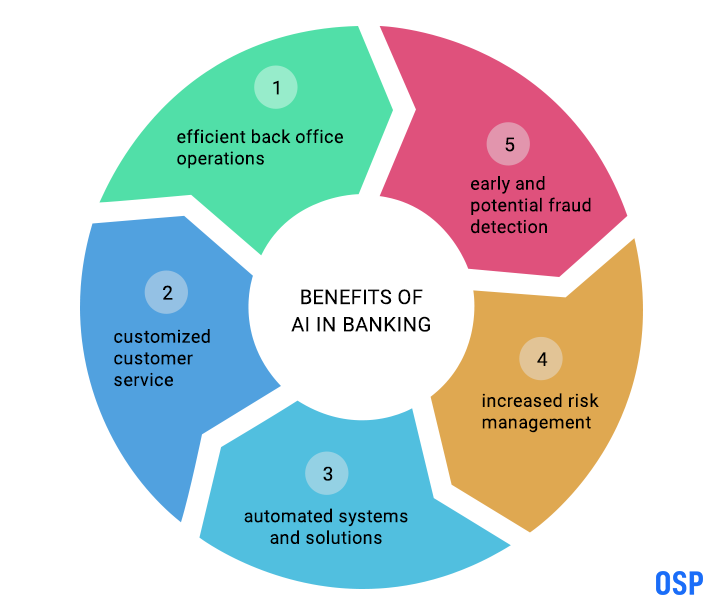 From personalized services for customers, to pattern identification and complex financial connections, the advantages of AI in banking is unarguable. The banking sector has been predominantly operated by human interaction as far back as one can remember. There are several challenges that the industry continues to face over this phenomenon. Delayed Financial Transactions: The dependency on human involvement to undertake financial transactions causes a significant delay. This is compounded by manual processing and adherence to inflexible working hours. Increased Customer Expectations: With evolving technologies and increased automation capabilities, customer expectations for banking services have evolved. Human interaction is not able to keep pace with the increasing demands for service. 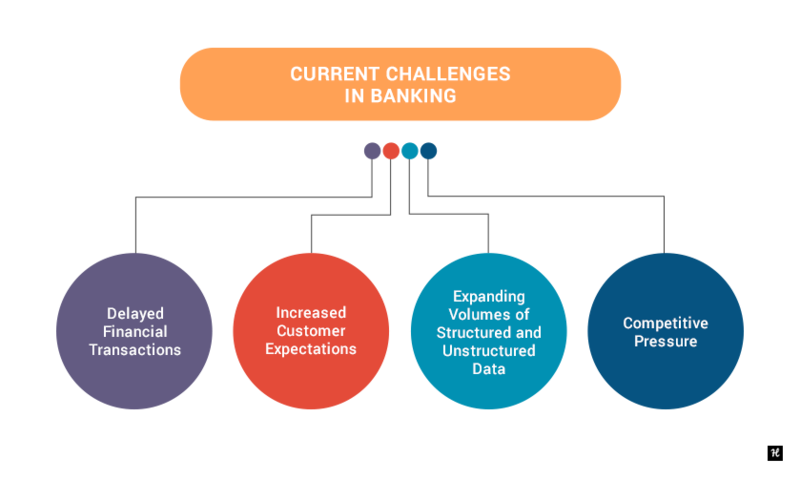 Expanding Volumes of Structured and Unstructured Data: With the banking sector exploding, wherein banking is now available in remote and rural areas, along with the increasing services offered by banks today, the volume of data is exploding. Banks are expected to meaningfully store, analyze and manage these huge volumes of data, which is proving to be increasingly tedious without automated systems. Competitive Pressure:Gone are the days when there was one central bank for all customers to conduct financial transactions. The competition is rising with banks around every corner. This competition demands higher levels of service and increased efficiency. The current AI technologies are empowered to interact, conduct financial tasks and create analysis that was previously only done by humans. The banking industry is increasingly depending on these technologies to offer streamlined and efficient banking services. Speedy Financial Transactions: Machine Learning (ML) is able to process natural language and incorporate learning that extends itself to faster decision making and more accurate financial transactions. Automated systems are capable of operating with little or no human interaction. Automated Data Analysis: Data collection, analysis and application can be conducted through automated AI systems at a level of efficiency and speed that is impossible for humans to accomplish. The automation feature for this data is applicable to very high volumes of data. Increased Personalization for Customers: Through the cognitive-based solutions that are embedded in AI technologies, it is now possible to offer customers with a highly personalized experience at a lower cost. Customized advice and offers provides the bank with a competitive advantage that is significantly attractive to customers. Fraud Detection:Automated AI systems conduct routine monitoring of account activities, suspicious behavior, pattern establishment, and flagging of irregular activities. This makes fraud detection and risk management more manageable.